A New York City Police officer was captured on video rushing toward a man who police say was threatening to jump from the Harlem River vertical-lift bridge in Manhattan. 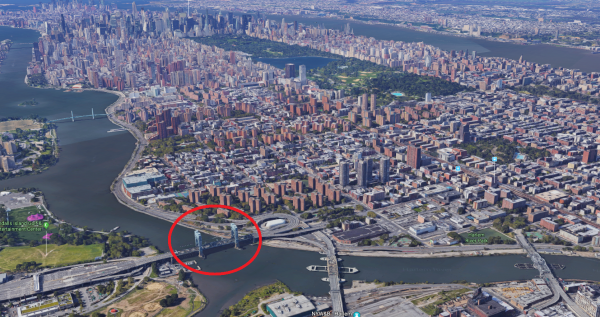 The 31-year-old man climbed one of the bridge towers around 2:30 p.m. on Sunday, March 25, the Harlem Patch reported. The lift bridge, part of the Triborough Bridge, also known as the Robert F. Kennedy Bridge, is over 200 feet tall, connecting Manhattan with Randall Island. Special operations officers from the NYPD Emergency Services Unit shut down traffic on the bridge and set up an airbag on the road. Meanwhile, harbor units waited in the water. At least one helicopter from the aviation unit also responded to the scene. A group of NYPD officers tried to talk the man into climbing down, but he tied a string around his neck and sat astride on a parapet lining one of the bride’s catwalks, one leg dangling over the long fall down. Officers were only a few yards away when the man apparently lost consciousness and fell down on the concrete parapet. It was at that moment when one of the officers rushed forward. In three fast leaps, the officer approached the man, grabbed his shirt, and pulled him down from the parapet. Officers performed CPR on the man, the New York Daily News reported, and lowered him on the bridge’s driveway, where he was handed over to EMS. He was taken to Harlem Hospital in serious but stable condition, police said. 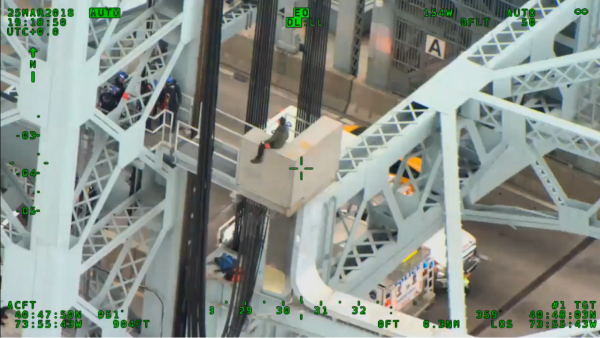 “Fantastic job by @NYPDSpecialops for using their training in crisis communication and team tactics to save man who was threatening to jump from the RFK Bridge,” NYPD stated on Twitter.